wow. much bad. very die. Let’s talk briefly about what made this game so brilliant. 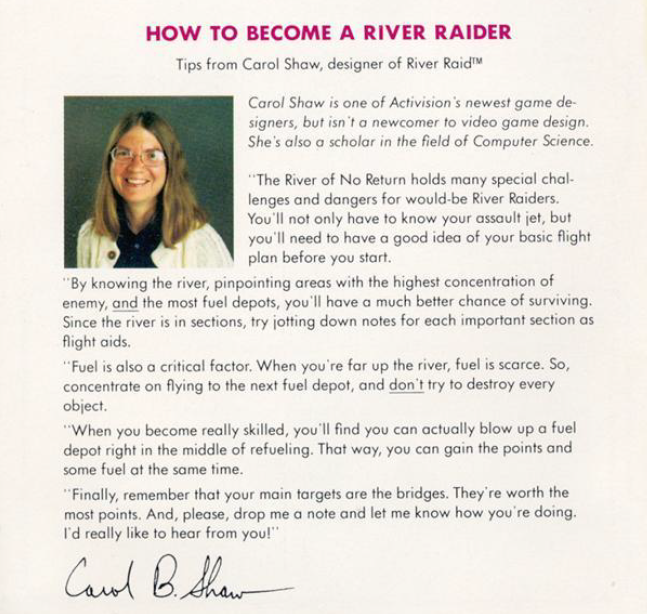 River Raid was very well written, with an abundance of non-flickering sprites onscreen with great collision detection and tight controls. If you run into an obstacle you have no one to blame but yourself (so, having done just that, I blame yourself). A trigger-happy player would be dismayed to discover that you can shoot the fuel depots and risk running out– this is definitely not a “shoot constantly at everything” kind of game. You have to be smart with your shots and if you get too aggressive you’ll pay the price. The plus side is that a particularly skilled (or lucky) player can shoot a fuel depot after touching it, getting both fuel and points. Shaw even encouraged players to do this in the manual. 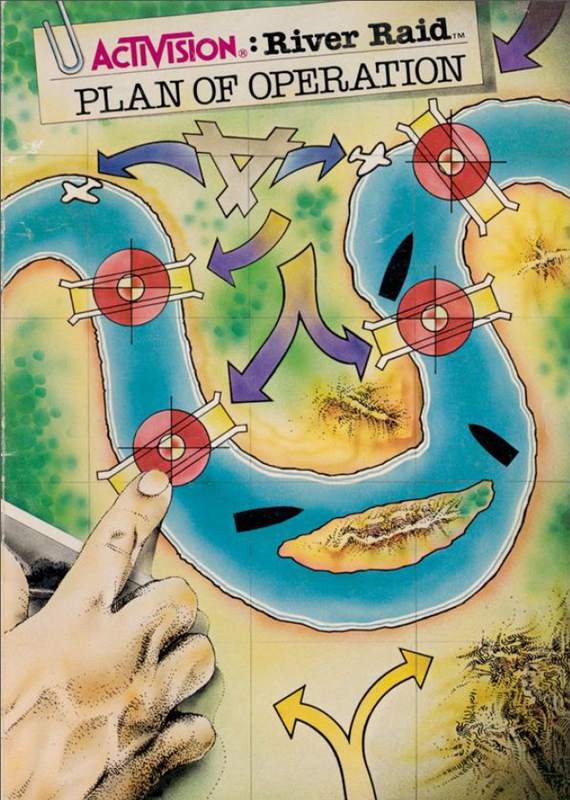 River Raid was the first game to be banned by “Bundesprüfstelle für jugendgefährdende Schriften” (Federal Department for Writings Harmful to Youths) for the effects it purportedly had on teenagers. The authorities stated that “minors are intended to delve into the role of an uncompromising fighter and agent of annihilation….” Note that it says “minors” specifically; apparently a work of fiction about a pilot who fires missiles at enemy combatants can’t be enjoyed by adults. The report went on to say that “playing leads… to physical cramps, anger, aggressiveness, erratic thinking… and headaches.” Oh, no. Not headaches too! Thankfully the Berlin Wall fell in 1990 and this federal department was dissolved as East Germ–wait, what? Hold on, this was in West Germany? Oh, pardon my mistake. It was the free, not-communist country that banned a work of art. How silly of me. Anyhoo, it’s all water under the bridge now. In 2002 Activision lobbied the reunified German government to remove its ban so they could release Activision Anthology on the PlayStation 2. The government acquiesced and the not-at-all evil-sounding “Unterhaltungssoftware Selbstkontrolle” rated it “free for all ages.” Apparently children nowadays are more resistant to headaches. Well, sure. If this doesn’t do it, what will? Thanks, Nickelodeon, by the way. For that. Thing.